Last year was a turbulent yet prosperous year for the built environment, not just in Portland, but across the globe. After a long recession, the pent up demand for new development frothed over forming an unstoppable avalanche of bulldozers, construction loans, and planning applications that quickly bombarded these sleepy cities and their long-dormant neighborhoods with tower cranes and unrealistically shiny renderings of new apartments, offices, and other private infill. Public outcry soon followed from the streets of London, New York, Los Angeles, Seattle, and Portland: ‘stop the destruction of our historic fabric!’ and ‘these new buildings are too big and out of place!’ were the cries heard everywhere. These of course are the same criticisms which occur with every economic boom, but this time it felt different for many Portlanders. 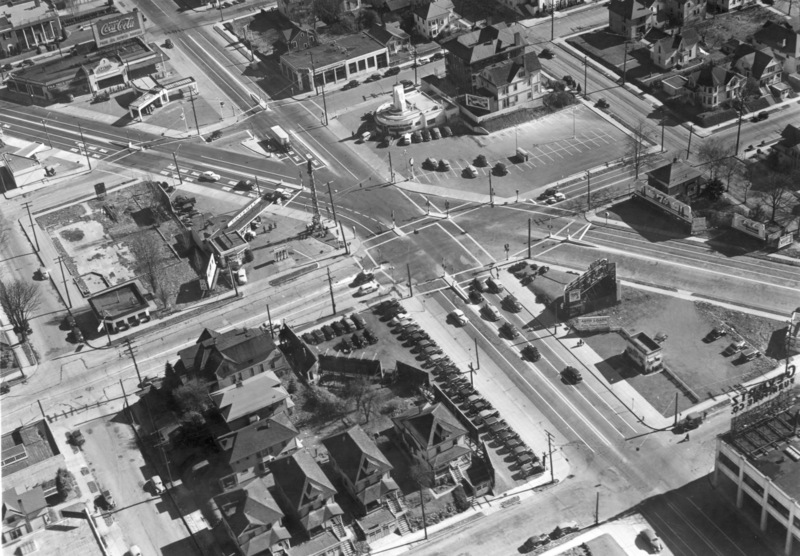 Perhaps it is because Portland, for the first time since the Lewis & Clark Exposition in 1905, has found itself in the national spotlight as a popular and desirable place to live. The days of the KKK marching in parades and the nights of walking on used needles on residential streets are all but fairy tales now, even among the few self-proclaimed “real” Portlanders out there. Despite the amazing makeover of this once dirty city, the inhabitants are now facing an even greater challenge today: its own success. Having already won a Citation Award and the Mayor’s Award from the AIA, it should come as no surprise that Ankeny 2/3 by COLAB Architecture tops our list as the best new small project of 2015. This project extends the original Ankeny Lofts, also designed by COLAB in 2011, to the West, and complements the 2015 completion of the adjacent Ankeny Row, another great residential infill project designed and built separately by Green Hammer, to the East. Where Ankeny Row focuses on creating a micro-community and sustainable building practices, built to Passive House and Net Zero standards, Ankeny 2/3 looks to focus on the greater community and the craft of unique spaces. Not that the Ankeny Lofts expansion is not also inward looking and sustainable, far from it, but those characteristics are more assumed, given elements rather than the end-all design narrative. Ankeny 2/3 looks to expand upon the success of the original Ankeny Lofts by extending the existing courtyard through the site, opening the units up to the neighborhood as places to live in or work out of. 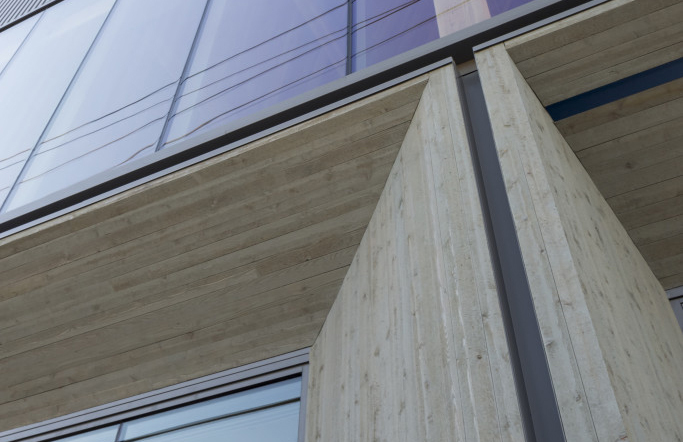 As with the previous design, the addition adds locally-crafted art to the alley-like scheme, featuring a centrally located Karl Burkheimer designed sculptural wall that complements the raw wood tone of the overall form. 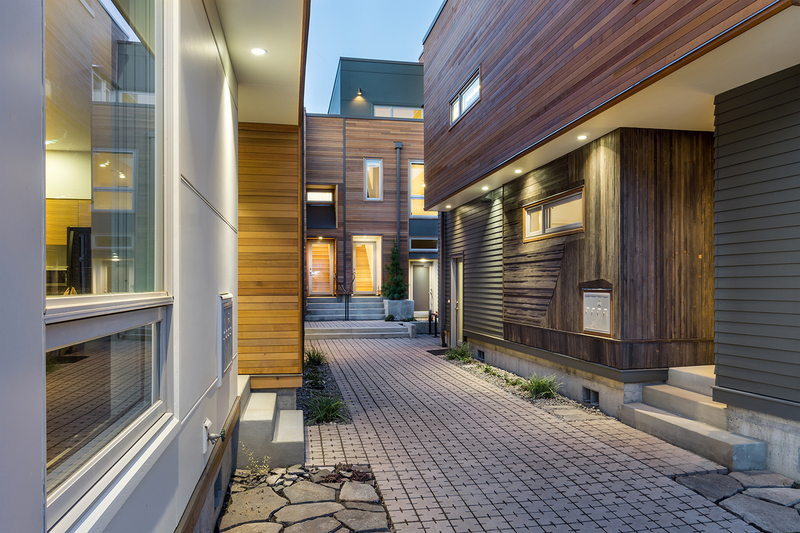 This small project not only enhances this prominent secondary street by creating new flexible density, but also by adding to the richness of the surrounding local fabric with its tactile materiality and open, welcoming presence. There were far fewer large scale projects built this last year, but some of them have made a lasting impression on the city’s skyline. Two of the largest projects, Park Avenue West and Hassalo on Eighth, ended their seven-year and two-year construction timelines respectively with little fanfare, as the downtown tower’s presence is marred by its unfortunate history and related expectations and all eyes already moved past Hassalo towards the much grander Oregon Square project proposed next door. Neither of these are great architectural achievements however, as both have already found their comfortable little places as Portland fabric buildings, but the full block remodel of the old Federal Building into Pacific Northwest College of Arts new home is worthy of the best new large scale project of 2015 for its creative and eloquent reimagining of the century-old building. 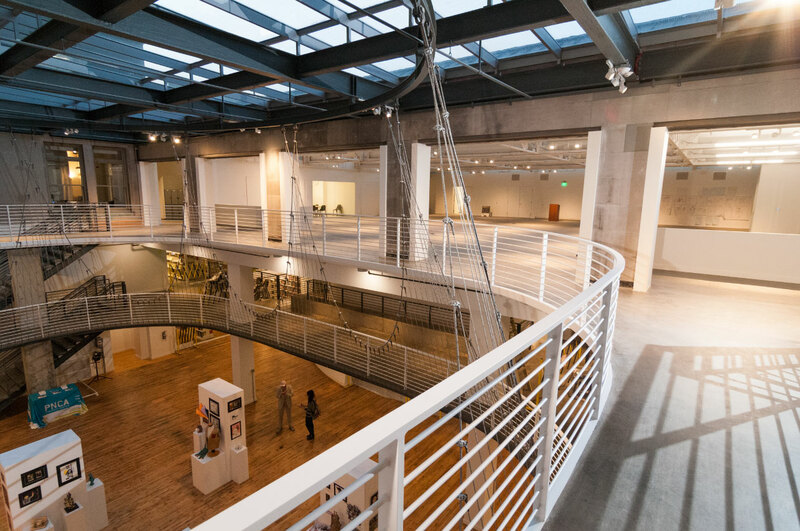 The Allied Works designed Arlene and Harold Schnitzer Center for Art and Design is one of only a handful of works created by the much-lauded local firm, and their vision has cemented PNCA’s long and ambiguous history into a 21st century institution. This project is also the only project on this list where the pre-built renderings have come close to capturing the real experience, something that could be an award in itself. 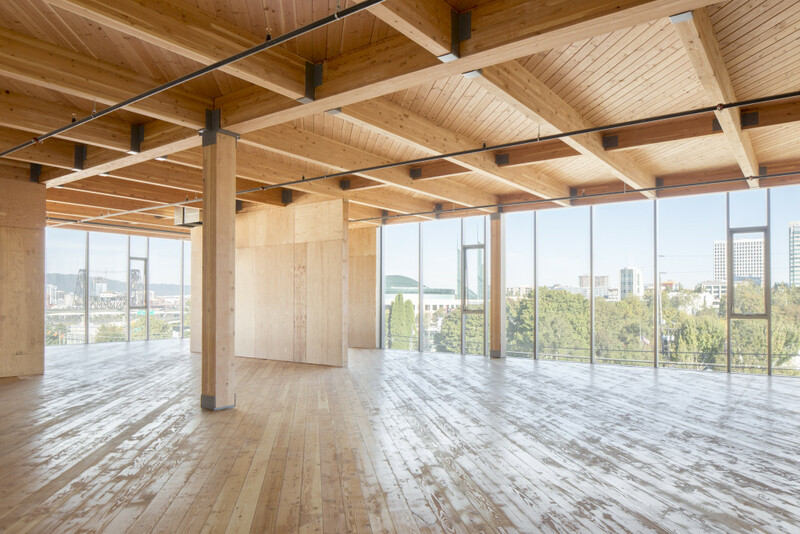 A vast departure from their horizontally focused Pearl District warehouse, PNCA has mostly consolidated its fractured campus into six stories of classrooms, studios, offices, and exhibition spaces. The new arts center, carved out of the remains of an intricately detailed yet heavy fortress, has been transformed into a light and airy space that is full of interesting architectural moments and juxtapositions, a literal metaphor for the work that now fills the halls. Unlike many other adaptive reuse projects, the design team appears to have found the perfect balance between historic preservation and contemporary design and programming needs. 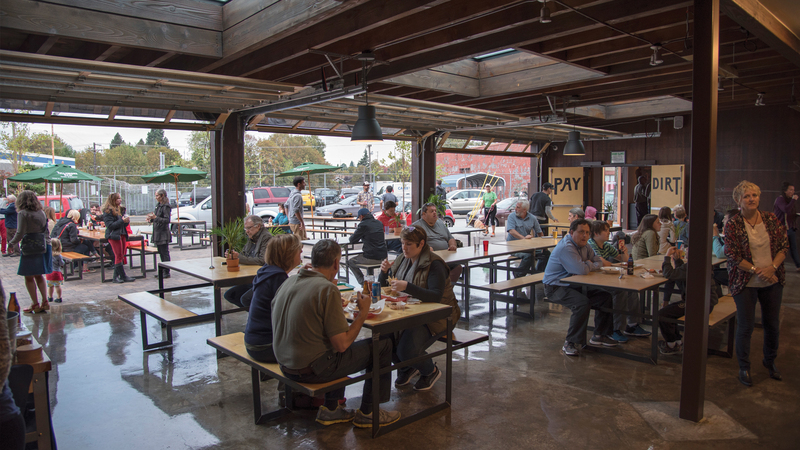 An unlikely candidate for sure, especially with the previously mentioned urban interventions of Ankeny 2/3, One North, and Hassalo on Eighth and the new South Waterfront Greenway on the table, but Guerrilla Development’s The Zipper micro-restaurant enclave makes the top of our list for best urban design of 2015. With a similar revitalizing effect as the nearby Ocean micro-restaurants, Kevin Cavenaugh’s latest built project The Zipper has done something many thought to be impossible: make Sandy Boulevard a relaxing and interesting place to be. Regardless of what one thinks about the somewhat gimmicky optical effects of the facade’s slats, the undulating form and mural-esque artwork have transformed this once remote asphalt island into a thriving community of local eateries and boutique shops. What is essentially a brick and mortar cart pod, this new building has done more for creating useful places out of underutilized space than any other project this year, and did it with a ridiculously small budget as well. Unfortunately, the same ground level energy appears to be missing from their next project, the Fair-Haired Dumbbell, but we will reserve judgement until that building’s completion next year. In retrospect, Portland has improved over the last couple of years, disregarding projects like LRS Architect’s dreary Grant Park Village and the myriad of bloated Renaissance Homes taking up valuable inner city land, the overall urban fabric has become more dynamic and livable. This year, however, will be a challenging year for the city, as a glut of obnoxiously boring hotels and apartment complexes are starting construction around the core of the city, and then there’s the regrettably named and out-of-place NV Tower still under construction. Those projects aside, there are still a great number of exciting projects in the pipeline, and without a doubt there are even better projects coming as the city keeps growing.